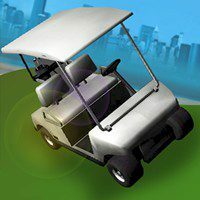 This game is for those, who can not live without driving any car. Just imagine that you are alone in this city. And you have a great chance to drive a real golf cart. So, do not stop and drive as fast as possible. We wish you good luck here. Have you ever played a real golf? But you have a great chance to drive a really cool golf cart. Just drive it and you will get a lot of pleasure. In this city you will not see any traffic lights, police , or just something that could prevent you while driving. Just practice a different kind of driving, but be careful not to slice the carts side off. Do not be worry if you do crash, just play this game again and again. Have you ever dream about something like that? So just do not waste your time and drive your vehicle immdeiately.